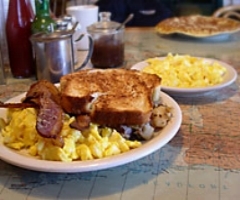 The Talkeetna Roadhouse is located about two-and-a-half hours north of Anchorage by road (60 air miles) and halfway between Anchorage and Denali National Park by road and rail on the Alaska Railroad. The historic end-of-the-road town of Talkeetna is know throughout the world as the base for international climbers making their way to climb Denali (Mt. McKinley). Talkeetna is also a popular destination for world class fishing, flightseeing, river rafting, dog mushing, horseback riding, and for those seeking the quintessential "small town Alaska" experience. 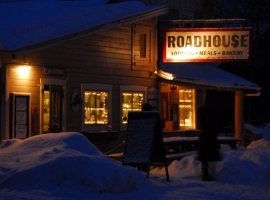 The Talkeetna Roadhouse, built between 1914-17, is one of the oldest establishments still in operation on Main Street in "beautiful downtown Talkeetna." 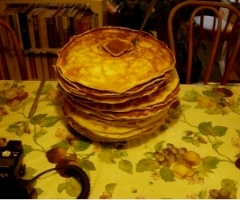 Our kitchen is open to the public and we've become famous for breakfast, hearty soups, home baked breads, big tables where all sit together and genuine frontier hospitality. 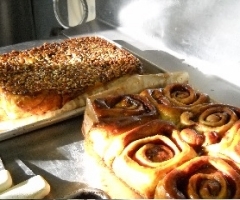 Our bakery produces all sorts of treats each day such as pies, variety of cinnamon rolls, cookies, cakes and brownies. The guest rooms range from private to hostel-style to rustic cabin. Bathrooms are "down the hall" in typical Roadhouse fashion. (In the case of our off-site, no-host cabin it's a 5 Star Outhouse!) Breakfast is a separate charge but we provide our guests with coffee/tea/cocoa throughout their stay. A computer is available for guest use for e.mail/Internet access and WiFi flows throughout the main building. We also have coin-op washers and dryers available daily 8am - 8pm. 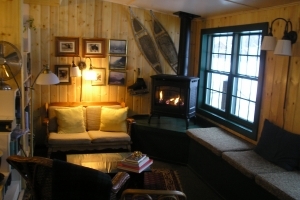 Since we're halfway between Anchorage and Denali Park Entrance, both by rail and road, an overnight stay in the Talkeetna Roadhouse is a great way to break up a long trip. Overnight guests wake up to the smell of fresh cinnamon rolls and hot coffee, the sound of local chatter and the rustle of the morning newspaper... and perhaps a fleeting feeling of just what Talkeetna was like nearly a century ago. Our rooms are simple, cozy and configured for singles, couples and families. The Outhouse was abandoned long ago and now, thankfully, the bathrooms are just "down the hall" in typical modern day Roadhouse fashion. The three rooms upstairs share one bathroom, equipped with a clawfoot tub and shower, Rubber Duckey, Mr. Bubble, sink and toilet. The two downstairs rooms, Bunk Room, and the "Little Cabin in the Back" share four bathrooms down the hall, three of which have showers. 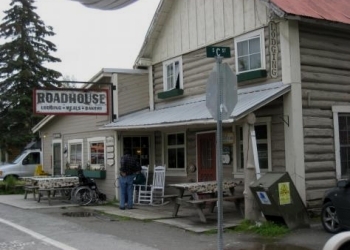 Our total capacity for overnight guests, including our off-site Trapper John's Cabin, is 27 people, making the Roadhouse a great home base for family reunions or other group gatherings. The Main Room in the Roadhouse has big tables on which to play cards or board games, spread out maps, write letters or enjoy a beer and a bowl of soup. The living room is host to a piano that is tuned twice a year, a rock fireplace that keeps couch lovers toasty and more National Geographic magazines than a person could ever read in a long, long Alaskan Winter!